Spend a great holiday in the heart of a private 4 acre property , which is fully reserved for you ( not shared location) . 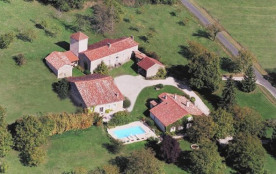 You occupy the large farm (typical habitat XVIII ) fully renovated 6personnes and the guest cottage adjoining but independent for 4 persons All is restored with taste and attention to comfort. You only enjoy this extraordinarily peaceful and protected place , surrounded by trees and greenery. Lovers of nature and calm ressourceront , but you will also ideally placed if you leave the chaise longue to visit castles, churches (including the fantastic underground church Aubeterre the largest in Europe and vaults 20m above), caves, museums , villages. Many colorful markets ( including Riberac one of the finest and most lively and France ) will supply you with fresh and tasty food , the culinary stops of our restaurants (closest to the village of Siorac 5 minutes ), you reserve for delicious moments and athletes will have the choice of activities: hiking with trails, mountain biking, canoeing on the Dronne, one of the most beautiful rivers in France , golf , tennis , horse riding, flying club circuits. Not to mention the miles of marked hiking trails in the forest of the Double with its majestic oaks, large pond Jemaye his leisure area , restaurant, and his lifeguard playground Not far from there, foot if you will, the farm Parcot , free visit to a traditional habitat of wood and mud , a natural protected area . The edges of the pool , admire the private lake of 5000m2 shallow and gently sloping banks , full of fish , ideal for fishing contests fun for adults and children and wildlife observation and local flora. Here's a great place for quality holidays . Visit places in detail on the website , where we give you the best reception . Spend a great holiday in the heart of a private 4 acre property , which is fully reserved for you ( not shared location) . 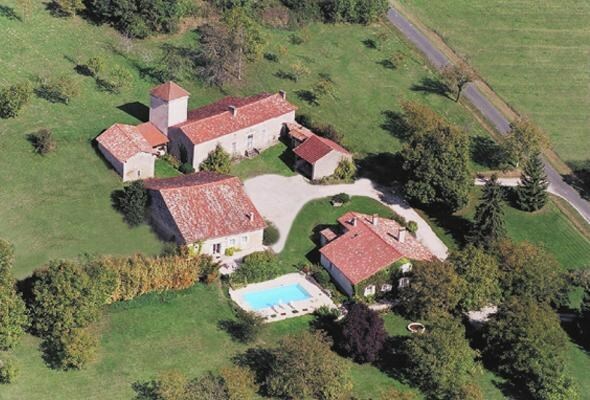 You occupy the large farm (typical habitat XVIII ) fully renovated 6personnes and the guest cottage adjoining but independent for 4 persons All is restored with taste and attention to comfort. You only enjoy this extraordinarily peaceful and protected place , surrounded by trees and greenery. Lovers of nature and calmwill be satisfied, but you will also ideally placed if you leave the sun lounder to visit castles, churches (including the fantastic underground church Aubeterre the largest in Europe and vaults 20m above), caves, museums , villages. Many colorful markets ( including Riberac one of the finest and most lively and France ) will supply you with fresh and tasty food , the culinary stops of our restaurants (closest to the village of Siorac 5 minutes ), you reserve for delicious moments and athletes will have the choice of activities: hiking with trails, mountain biking, canoeing on the Dronne, one of the most beautiful rivers in France , golf , tennis , horse riding, flying club circuits. Not to mention the miles of marked hiking trails in the forest of the Double with its majestic oaks, large pond Jemaye his leisure area , restaurant, and his lifeguard playground Not far from there, foot if you will, the farm Parcot , free visit to a traditional habitat of wood and mud , a natural protected area .